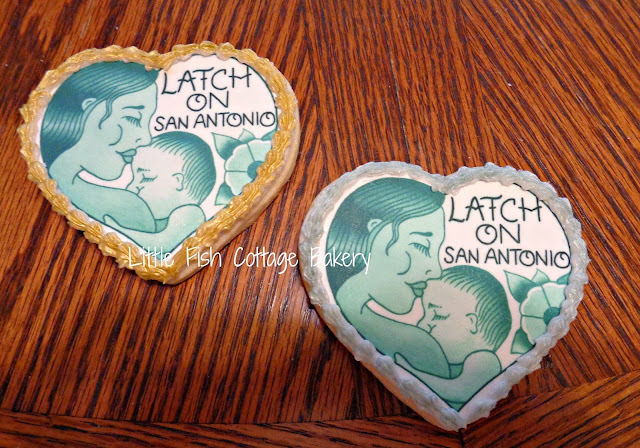 Breastfeeding-Inspired Cookies for Latch on San Antonio! A old friend of mine is breastfeeding mother and a breastfeeding advocate here in San Antonio. She works closely with a group called Latch On San Antonio. 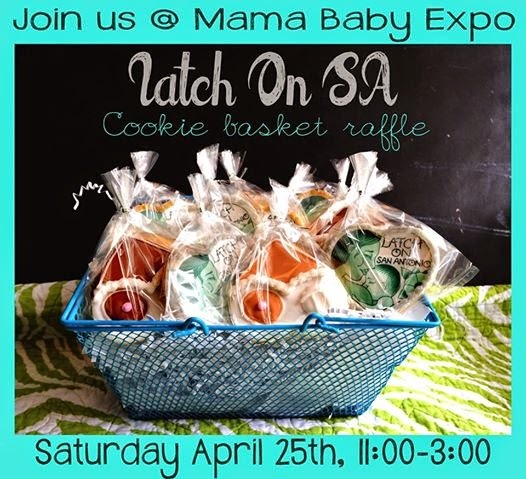 I was so excited when she contacted me about making some cookies for them to include as a raffle prize at an upcoming event called the Mama Baby Expo. In the dozen she ordered, she wanted the group's logo and...wait for it... boobies! Yes, boobies! I've had some unusual requests definitely, but boobies were a first for me! 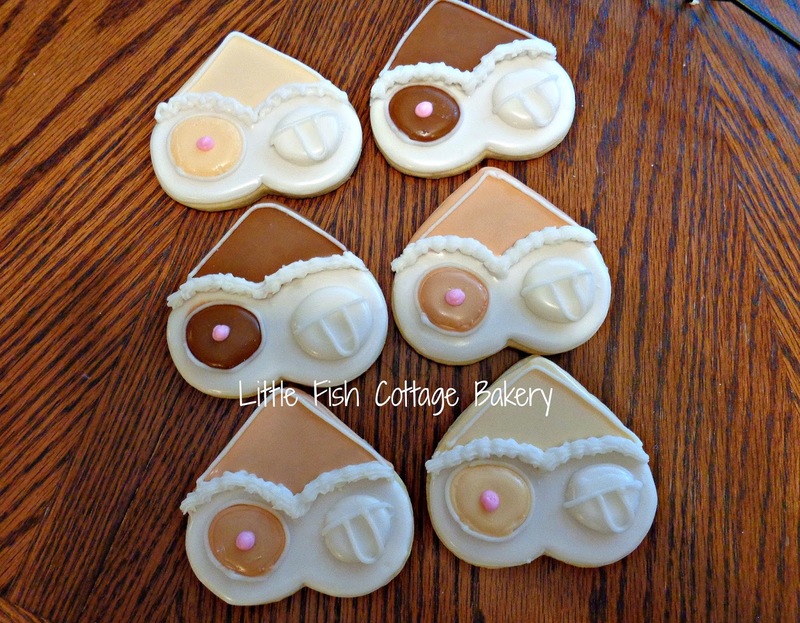 I had never worked with edible images for cookies before, but I decided it was best to order images for the group's logo. I try really hard on every order I take, but that logo is so detailed and pretty, I never, ever could have piped that picture and done it justice. 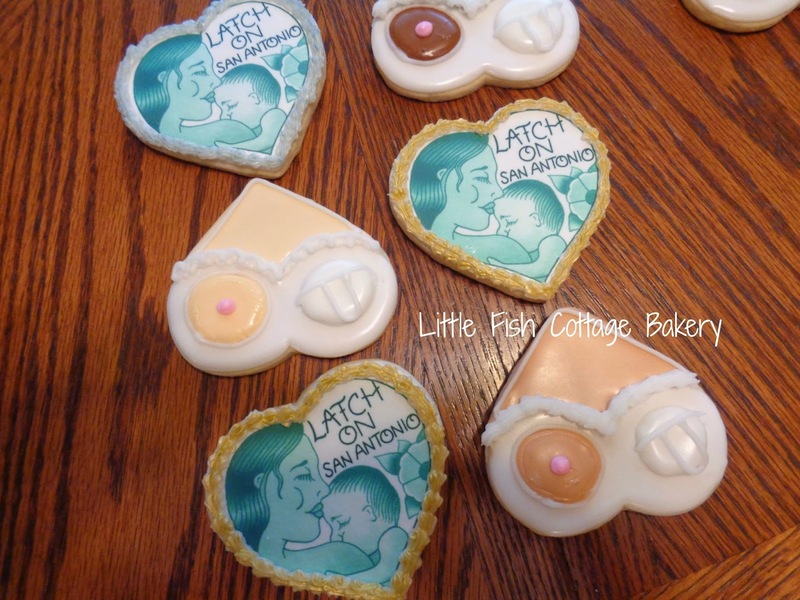 For the other special request, I saw similar styles of nursing bra decorated cookies on the internet that helped me develop a perfect breastfeeding-inspired cookie style for my friend's event. So, pictured here are the requested boobies in nursing bras in different flesh tones. I mean, everyone knows breastfeeding ladies come in many colors! This was such a fun project, and I'm very proud to have been asked to help out. I'm also so very happy I got to work with a great girl again and I hope her booth at the Expo had a lot of success!